A new lesbian and gay themed South African big screen drama that’s already won international accolades will be released in local cinemas on Friday 2 October. 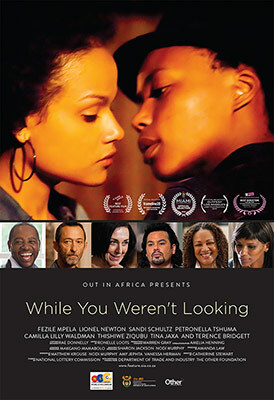 While You Weren’t Looking is the first feature film produced by the Out in Africa Gay and Lesbian Film Festival and possibly the first LGBT South African feature produced in the country since 2011′s Skoonheid. Described as a complex interweaving tale, it begins twenty years into the New South Africa as ageing academic Mack (Gums and Noses and Sorted’s Lionel Newton) looks for Salute, the young freedom fighter he sheltered and loved. Salute (Fezile Mpela of Mzanzi and 7de Laan fame) has moved on. He is now Joe, married and with a child, rising in government and party structures. In the meantime, affluent mixed-race lesbian couple Dez (Binnelanders’ Sandi Schultz) and Terri (Tempy Pusha’s Camilla Waldman) struggle to maintain their own desires and ambitions while reining in the rebellious instincts of their beautiful teenage daughter, Asanda (Of Good Report’s Petronella Tshuma). As their daughter falls for Shado (Man on Ground’s Thishiwe Ziqubu), a girl from a different background, Dez and Terri must cope with their own hypocrisies and secrets, which threaten to unravel the seemingly perfect world they’ve crafted. While You Weren’t Looking was shot by Amelia Henning on locations in and around Cape Town in just 24 days. The soundtrack includes the likes of Toya Delazy, Zaki Ibrahim, Spoek Mathambo and Umlilo. Funded by the National Lotteries Commission, the Department of Trade and Industry and the Other Foundation, While You Weren’t Looking won The Pink Apple Audience Award in Zurich. Director Catherine Stewart was also honoured with California’s QFilms Jury Award. Executive Producer Nodi Murphy told Mambaonline that the film was a labour of love for the cast and crew and credited the National Lottery for the opportunity to make it. She revealed that the film was made within 12 months from the date of being awarded the funds, including scripting and editing. “It was a unique opportunity to make a film because nobody else is making queer films in South Africa,” she added. While You Weren’t Looking screens at Cinema Nouveau in Durban Gateway, Pretoria Brooklyn, Johannesburg Rosebank, Cape Town V&A and SK Maponya Mall from Friday 2 October. You can book here. Watch the film’s trailer below.